DIY Birthday Cake Stand for under $10! 23 Sep DIY Birthday Cake Stand for under $10! Continuing with our birthday week celebration, we have a fun little DIY on the blog today! This super easy project cost less then $10 to make and in total took less then an hour to assemble. It’s that easy! It’s also the perfect craft if you are in need of a way to display yummy bake goods. Directions below! First gather all your materials along with some newspaper or scrap paper to spray paint on. Be sure to spray paint either outside or with the windows/doors open has the fumes can be strong. Coat all sides of both the plate and the candle stick holder, allowing sections to dry before flipping either. Let it dry thoroughly! I spray painted my pieces and then mounted, although you could also mount and then spray…up to you! With the plate now dry and facing down, coat the top rim of the candle stick holder with adhesive. Place in the center of the plate. I also put a heavy object on top of the candle holder to help the setting process. Again, allow the bond to dry! 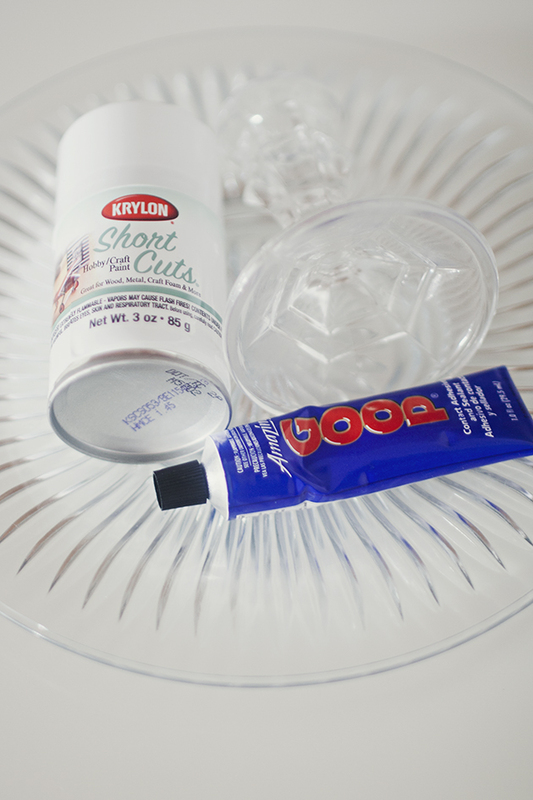 Do not remove or pick up too soon as the glue needs time to set. Make something yummy to go on the cake stand! Also, you can find an acrylic spray to seal the stand, or simply be sure to create a barrier between the item and the top of the stand. I used wax paper, but you could also use a paper napkin or doily just to be safe. Stay tuned for another fun DIY post this Thursday, along with free downloads and printables throughout the week!